Yes, you can learn optimism, and you’re quite right that being optimistic is one key to healthy aging. The most recent evidence of this comes from a survey of 500 older people, aged 60 to 98. The researchers, from the University of California, San Diego School of Medicine, asked the participants whether they felt they were aging successfully, how they were adapting to the changes of aging, and whether they felt that they had control over their lives. Then, they asked participants to rate their degree of successful aging on a scale of one to ten. When the researchers later compared these self ratings to information gathered earlier about each participant’s physical health, they found that optimism and coping styles were more important to the perception of successful aging than physical health. Learn to identify habitual thoughts and images that make you feel sad or anxious, particularly those related to aging. Practice substituting positive thoughts and images for negative ones. Spend more time in the company of people who have positive attitudes toward aging. Don’t give up on this process – it takes time and practice to make the changes you seek. And bear in mind that it’s never too late to change self-defeating habits that may be affecting you physically, mentally and socially. At any age, you can get a new lease on life by exercising your mind and body and by taking an active interest in your friends, family and community. I am so delighted to have recently reconnected with a friend from my past. Our children went to preschool together. Shortly after the end of the school year, Charlotte and her husband, Alan, moved from Connecticut to New Jersey so their two girls could get situated in kindergarten there. Although we were good friends, we lost touch. You know how that goes”young mothers get super-busy and our focuses and priorities shift with our responsibilities. And way back then, there was no Internet or cell phones, which admittedly now make things a whole lot easier on a lot of fronts. Our children are now inching their way toward their 30s, and Charlotte is about to become a grandmother. The clic, “Where did the time go?” never felt so apt and so raw. I won’t hog this platform right now”though I easily could, by telling you how wonderful it is when you can pick up almost where you left off. This blog post today belongs to my new-old friend, Charlotte, who has taken a similar path to mine and immersed herself in the health field by becoming a certified holistic health coach and nutritional expert. Do you wonder from time to time how you’ll look when you reach 70?Â Or 75? Do you think about how your health will hold up?Â Many women worry about getting older. If you haven’t given this any thought, good for you! You’re probably doing just fine. On the other hand, if these thoughts have passed through your mind, you’re also doing fine â€¦ you just may be a little curious, wondering how you can possibly impact how your life will unfold. We all know how important our mind-set is in terms of our overall health. There have been many studies done on individuals with a positive attitude and how that translates to overall good health. So, how can we develop a healthy attitude as we get older? Here are some of my thoughts about that. Everything you eat becomes YOU. Eating lots of vegetables and some fruit as well as good-quality protein and healthy fats is vital for overall good health. Eating foods of various colors is important for bringing in those antioxidants that clean up those free radicals. And, free radicals damage your cells and accelerate the aging process. Eating Smart = Thinking Smart! Water is key to healthy skin and a healthy body. 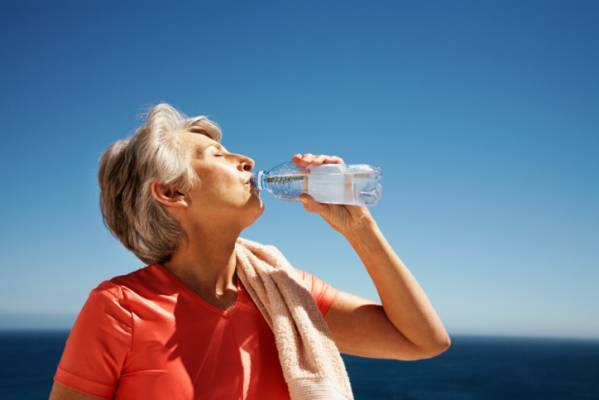 You should drink half your weight in ounces of water. Ex: 120 pounds = 60 ounces of water. Many of my women clients tell me how they were told to stay away from fats because they are not good for them. This couldn’t be further from the truth. Healthy fats are ESSENTIAL for good health. And, our brain needs fat! Some good sources are grass-fed butter, ghee, coconut oil, extra-virgin olive oil and avocados. You’ve heard the term, “Use it or lose it”? Well, when we’re inactive or have succumbed to couch potato status, our muscles begin to weaken, causing us to feel lethargic and tired. According to Mark Sisson from Mark’s Daily Apple, the human body is designed to conserve precious energy. If you are sedentary, you are sending a clear message to your cells (e.g., your muscles, bones and brain) that they aren’t necessary. Your muscles weaken, your bones shed their valuable osseous materialâ€”thereby even your mental capacity begins to slowly deteriorate. While stress can help us in emergency situations with the release of cortisol, it does not help us when we are chronically stressed. Chronic stress ages us! Do whatever it takes to reduce your stress, whether that means getting rid of toxic relationships, getting off a junk-food diet, quitting smoking or exercising more. I often talk about sleep because I feel it’s one of the most important components to good health. Sleep is crucial for cell repair and regeneration. Try to get 7-8 hours each night. Everything feels better when you get a good night’s sleep. Remember the fun you had as a child? Even if you were playing by yourself in the dirt or in your room, you were most likely very happy. I’m sure you’ve heard the phrase, “You’re as young as you feel.” I like to think, “You’re as young as you tell yourself.” If you’re always complaining about being tired or sick, then you’re “tired and sick.” Train yourself to think positive thoughts. This is YOUR life. You’ve earned the privilege to live it with joy and happiness. So You Think You Can not Have a Better Memory?